Advocacy services: In 2018, advocates provided over 8,000 hours of face-to-face advocacy services for local families. That averages out to nearly 22 hours every day of crisis counseling, safety planning, educational support groups, and other advocacy support. But, those 22 hours are more than just the work that our advocates have put in, it represents the hard work that the families in our programs are putting in each day by addressing the difficult areas of their lives that they can change. Job training: Stepping Stones Thrift Stores and Step One Coffee House are much more than awesome places to shop, they serve local families by providing paid job training programs. Through the Employment Enhancement Opportunities Program (EEOP), adults learn on-the-job skills that will help them as they find future employment in the community. From customer service to merchandising to food service, our social enterprises serve adults who are working hard and need a helping hand. Volunteering: Volunteers at Stepping Stones are an amazing group of teens and adults who serve across our agency. 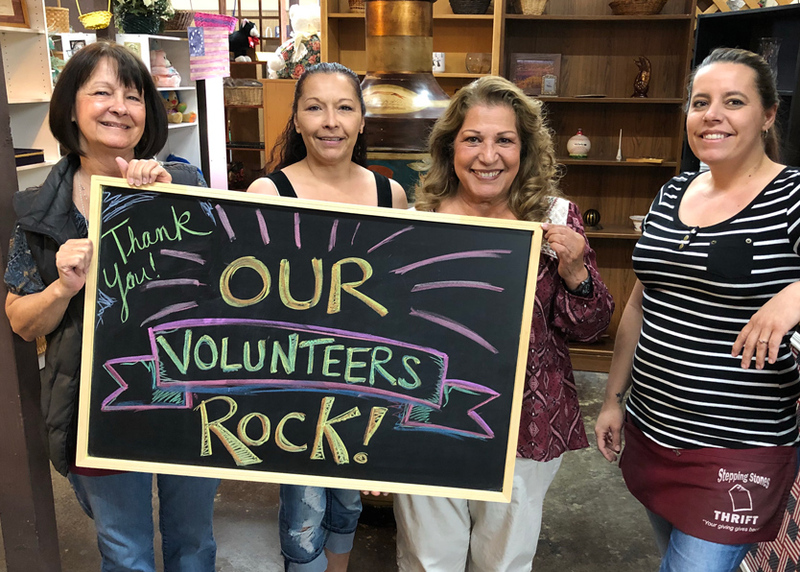 From helping in the thrift stores to providing support in the shelter and administration office, volunteers bring their skills to the table and learn new ones, too! These amazing people provide advocates with the extra hands they need to help families move away from abuse and into healthy, positive futures. Want to get involved? Call us! You can talk to our volunteer coordinator Jesus if you want to start volunteering OR give us a call if you want us to share more about our services with your group, club, or church! Call our administration to learn more: 928.772.4184. Finally, day or night, our advocates are always available – 928.445.4673.